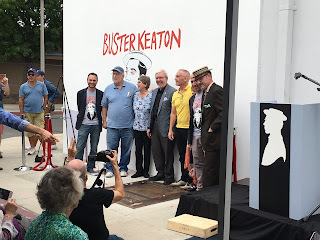 I just got back from a whirlwind trip to Los Angeles for the dedication of a memorial plaque that was placed on the site where Buster's film studio in Hollywood had been and I'm still charged up by the experience. This was such a lovely event and I am beyond grateful to those who made it happen! Because the great bulk of activities over the weekend were free or reasonably priced and open to all I brought my extended family along and we all enjoyed ourselves thoroughly. 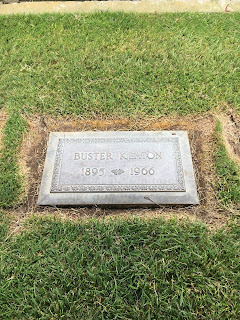 Another thing we did -- and I've always felt a bit sheepish about my desire to do this, so have never been there before -- was to see Keaton's grave. In the spirit of the weekend it felt like the right time to make the pilgrimage. 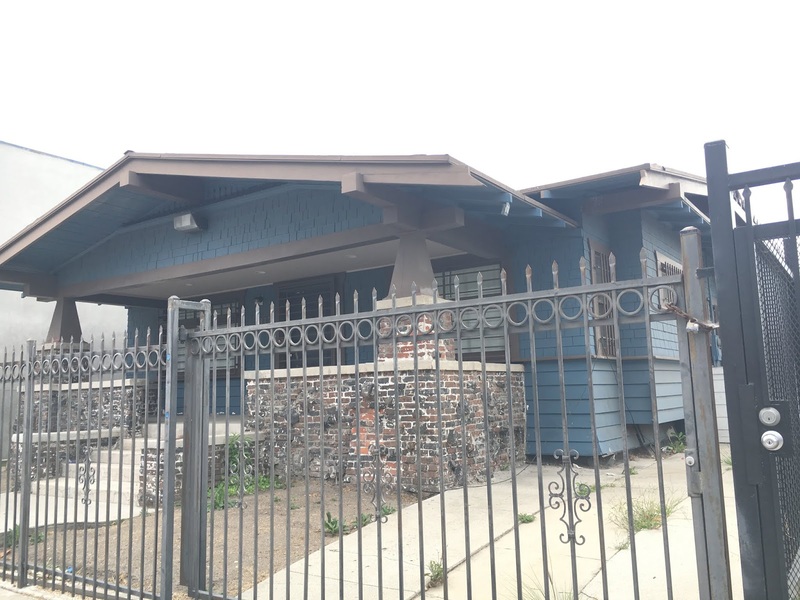 Keaton is laid to rest in a stunningly beautiful area at the base of some brown hills that are a weird mix of craggy and rolling near Griffith Park tucked away in a part of LA that is truly lovely. 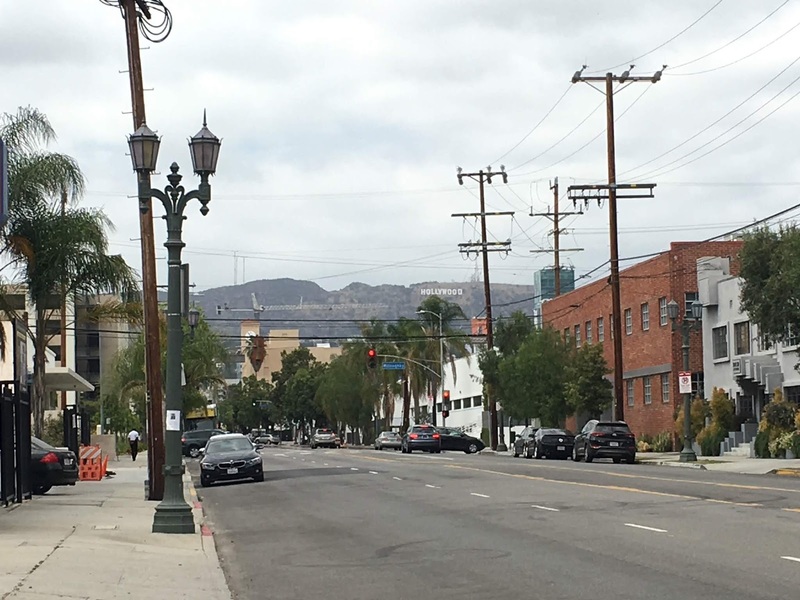 The Forest Lawn Hollywood Hills location is extensive! 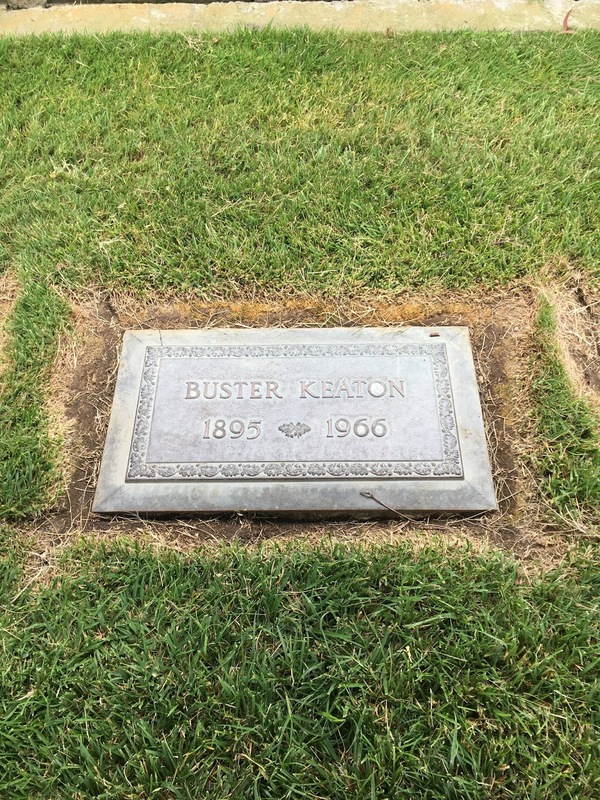 I would never have found Keaton's plot without the pdf location map provided by the International Buster Keaton Society which planned the weekend's festivities. The grave markers there are mostly small, flat and modest, like Keaton's. This gave the impression almost of a military cemetery, with its striking uniformity and rambling, impressive grounds. It felt sweet and appropriate to be there offering our respects. I took a bit of bark from a Eucalyptus tree that was growing next to it. Haven't decided what to do with that yet, but since it's been riding around in my wallet for the last several days, hopefully there is something left beyond dust to work with! After the cemetery and a quick bite to eat, we were up for another tour! Again with Bengtson, who must have clocked 20 miles and 20 hours over Saturday and Sunday, mostly canvasing the same ground repeatedly (and well-deserving of accolades) we learned about the films that were shot in and around Keaton's former studio location in Hollywood on Elinor Ave and Lillian Way. I'd been to this area before but that was back in 2012, which I am now stunned to realize was 6 years ago! ... the year I started this blog. OK. gotta pause and think about that. ... Man. Alright, I'm back. A lot has changed in the neighborhood from the last time we were there. There is now a fairly significant homeless presence in something of a tent city that wasn't there in 2012. Also, while back in 2012, this area had seemed a bit forgotten, with a light industrial feel but empty streets and easy parking, it was now crowded, bustling and garbage-infused. While it wasn't immediately clear how much of the parking crunch that we encountered was due to the Keaton event itself, we couldn't have been the only reason. It turns out there's simply a lot going on in this area now, including a night club that people were waiting in line outside of and many, apparently thriving, businesses. 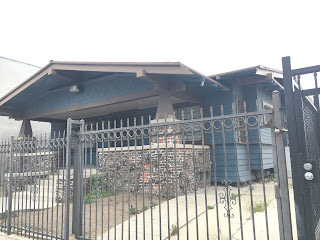 I was sorry that we didn't get to go inside the lot where Keaton's studio had been, but we did walk all around the exterior with Bengtson pointing out the sites. We were directed to look at this house that appears in ... well, I'm sorry to say I don't remember which film(s)! ... but something of note. I will review my video clips and see if I can find it. lol. Pretty cool to see some building, any building, still present that had been a part of the backdrop scenery when Keaton was filming nearly 100 years ago. On the site of the former Keaton studio (whose buildings were demolished in the 1930s) now sits a large warehouse utilized by a company called Quixote that does production supplies for films. I love knowing that this magical plot of land -- infused with Hollywood film history -- is still being used for industry-related business. 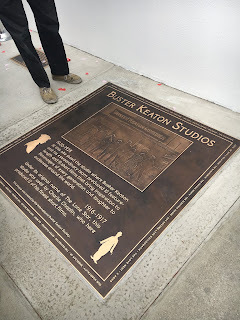 Given the way the bustling surrounding worlds was carrying on around us, I was feeling particularly grateful that the current owner/tenant of the Keaton studio space was indulgent -- willing to get invaded by a bunch of Keatonians and endure the ceremony and plaque. Then I learned that the manager in charge of that location is himself a Keaton fan! So cool. Just another random little fact that seemed to fall into place and feel right. 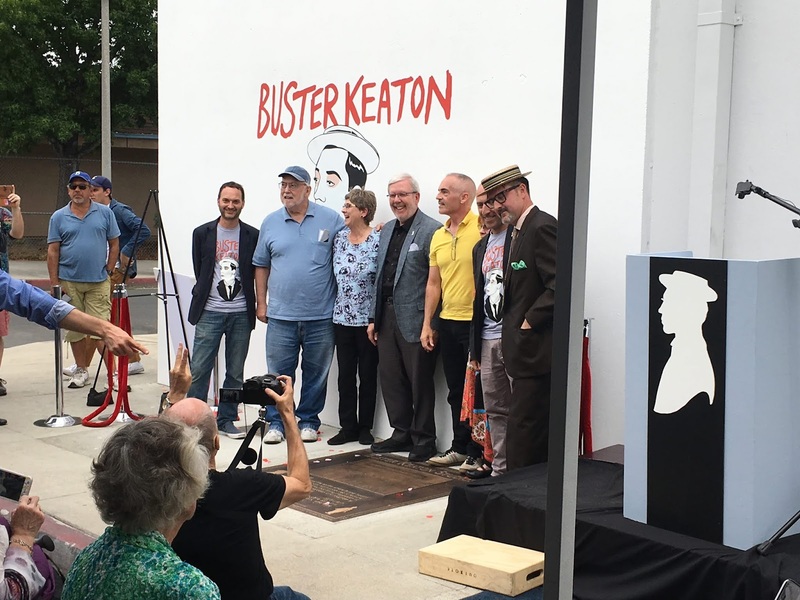 Of course, the chief highlight of the Buster Keaton LA Weekend has to be the actual plaque dedication ceremony. To anyone who isn't familiar with the backstory, in fact there was already a Keaton commemorative plaque at this location. It was dedicated in 1988. But unfortunately it was placed on the wrong corner -- a situation that many people felt needed to be rectified. The plaque had other problems too, such as being difficult to read. 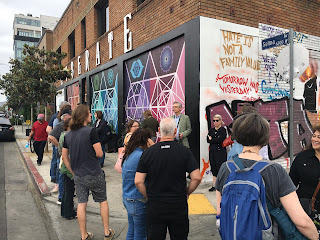 So a fundraising campaign was begun, spearheaded by folks present at the ceremony (such as Alek Lev and Patricia Eliot Tobias), and a great deal of effort I'm sure, involving permits from the City of LA and other logistics, was undertaken as a labor of love for many. I myself followed the campaign's progress with rapt attention and planned to be present at the unveiling if there were any way possible. Luckily, there was every way possible. We simply drove to LA for the weekend. I feel lucky, and again grateful, to have been in position to do this! As if all of that weren't enough... we also were thrilled to have the opportunity to attend a screening of The Cameraman at Grauman's Egyptian Theatre on Hollywood Bvld. And then The Cameraman. Seeing this on the big screen with other die-hard Keaton fans and an amazing live music accompaniment was a treat. This was only the second time ever that I've been able to see a Keaton film in an actual theater. It is an experience which is palpably better in every way. The laughs are bigger, Keaton's beautiful face is more present. The charm of the Yankee Stadium bit and the shots of Keaton running through the streets of New York hit their marks in a way that just can't be replicated on the computer screen. The Cameraman was a perfect choice and speaks to the obvious care and attention to detail poured into this event by its organizers. 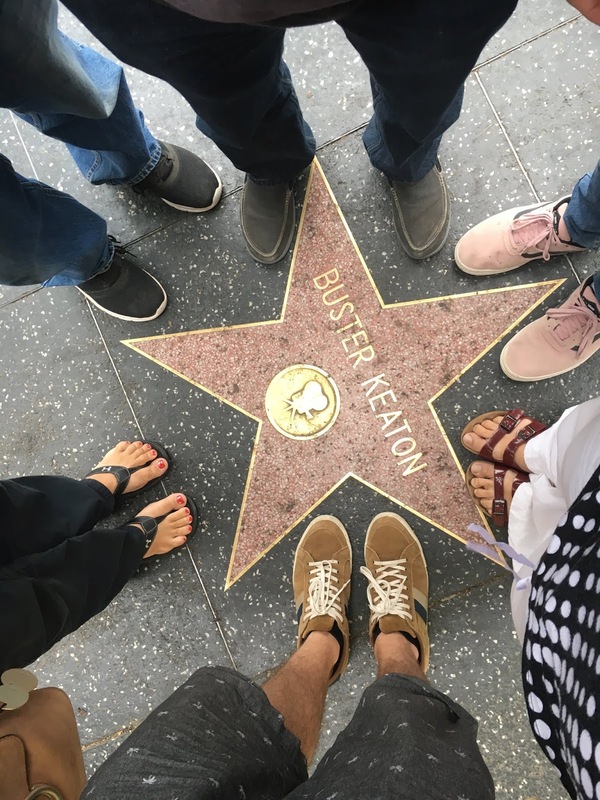 We had a blast at Buster Keaton Weekend! 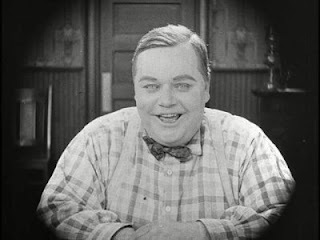 Roscoe Arbuckle must be an interesting figure to any serious Keaton fan. How can one have an informed love of the later without a bit of respect for the former? Assuming that the modern fan does (respect Arbuckle, that is), the question is what to call the guy. Here is the one who gave our hero his start, who mentored him, who offered him a connection, friendship, a sounding board, a job. Here is a fellow without whom we might not have ever been able to indulge in the cinematic talents of Keaton! Arbuckle is a grand figure in the story of Keaton. The more I read about Keaton, the more I learn about Arbuckle, and the more I feel the need to talk about him . . . leading inevitably to the crisis that comes when one must refer to him as something other than a last name or a pronoun. For me, up till this point, the moniker has always been "Fatty." How I got to that name was straightforward enough. After discovering Keaton, back in 2012, my interest became insatiable. It wasn't enough to watch Keaton's films; I had to learn about his life including his early work. I had to watch the early shorts. Of course that lead directly to Arbuckle. When I first encountered the connection, I admit that Arbuckle's name held a certain cache. He was a shadowy figure. I do remember him from my childhood. No, I'm not THAT old! but back in the 70s and 80s, silent films did play on TV and I have vague memories of hearing about him and, of course, the scandal. It wasn't the kind of thing anyone learned in school, but I'm sure it came up through my viewings and readings about early cinema. 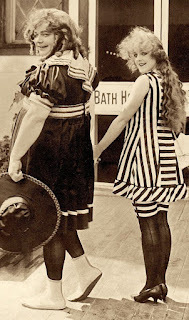 In fact, I vaguely remember a childhood friend telling me that Arbuckle had killed a girl. In any case, the name "Fatty Arbuckle" existed in my memory banks and probably held more associations for me than the name "Buster Keaton" did when I encountered each a few years ago. 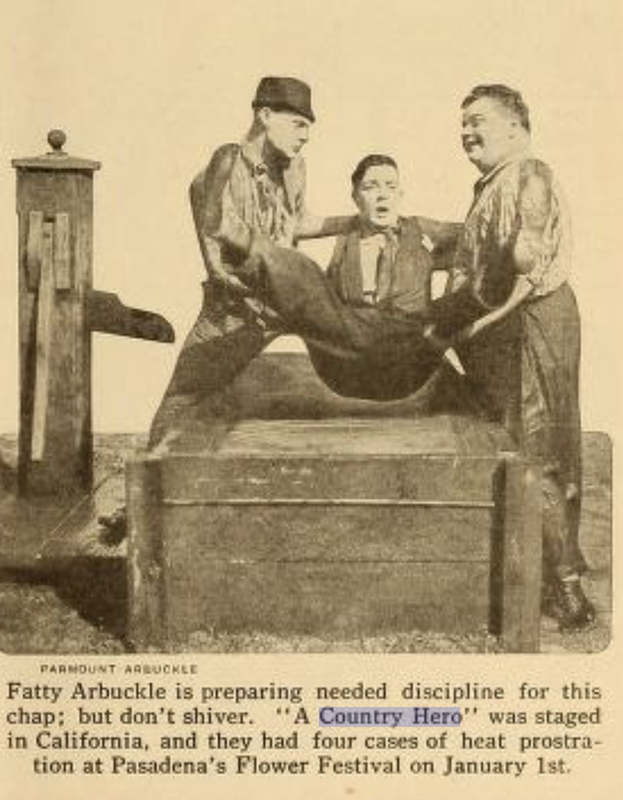 All of this is to say that I didn't really question thinking of Fatty Arbuckle as "Fatty," any more than I questioned thinking of Buster Keaton as "Buster." (Or, I don't know, Curly of Three Stooges fame as "Curly.") It was just what he was called. When one does stop to question this, of course, there is an obvious distinction - "Fatty" is clearly derogatory in a way the other names aren't. Now I am not so insensitive to have failed to notice that in 2012, but there was a reason I stuck with the name "Fatty" when I referred to him in my writings. I read somewhere that "Roscoe" is what his friends called him and that "Fatty" was what his fans called him. That was good enough for me. I was going to class myself with the fans (which is what I was). I was not so pretentious to think that Arbuckle was my friend. So I went with "Fatty," but noticed there were others who called him "Roscoe." To me, that felt false - as if these folks were broadcasting an entitlement to a certain level of intimacy with the man. So I stuck with my choice. But then, time passed. And I learned more. During this past year, I started to do more reading about Arbuckle as I turned full attention to the Centennial year of Keaton's entrance into film. Because Arbuckle was such an essential player in the Keaton story at that juncture, I explored more and more Arbuckle-based materials. And I now realize that there's a good reason for modern writers to call him "Roscoe." Its goes beyond the idea that "friends called him 'Roscoe' and fans called him 'Fatty'" to the important reason why this was. Arbuckle's friends called him "Roscoe" because he didn't like the nickname "Fatty." According to biographical accounts, Arbuckle didn't choose the nickname; and when people -- fans and the press -- started to call him by it, he at first tried to distance himself from the name. When he was unable to do so, he tolerated it for his career but continued to disdain it. This alone might have been enough of a reason for me to switch horses and start using Roscoe, but a further consideration weighed even more heavily (pardon the pun). 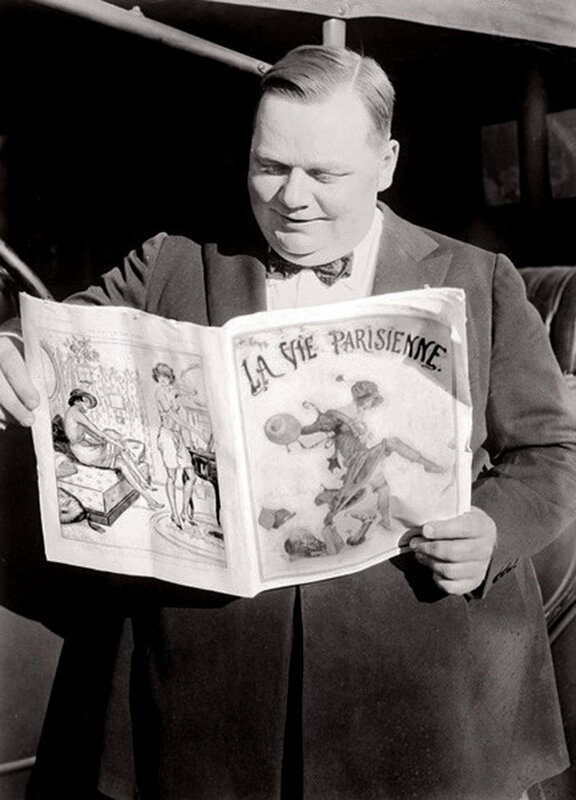 A new research project I'm working on (stay tuned) has given me reason to read a lot of media accounts of Arbuckle's activities in 1917. I have now read dozens of archival newspaper articles about the man, and in doing so have gotten a taste for the condescending way the media treated him, while ostensibly professing great admiration. This was long before the scandal that ended his career, back at a time everyone was charmed by him. By today's standards, newspapers were unfathomably impudent -- freely speculating about how much he weighed, peppering their accounts with reference to his size, speculating about damages he could cause or special equipment he might need. It's rather surreal. And honestly pretty offensive. I have a newfound appreciation for the way not just the moniker, but the cottage industry of treating his size as an exhibit, must have grated on the man. In honor of that, I will refrain from it's unnecessary further use and call Arbuckle ROSCOE. There's only so much one blogger can do when a century of history has established this nickname. But I'm ready to do my part. So sad how much history this man's memory needs to live down! 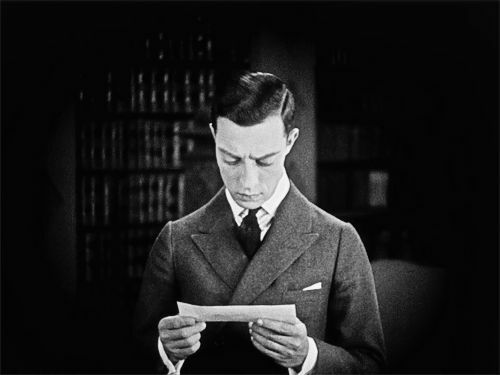 I'm excited to finish up the Buster Keaton Centennial Extravaganza in the same way that I started it back in March : with a big ol' research project! 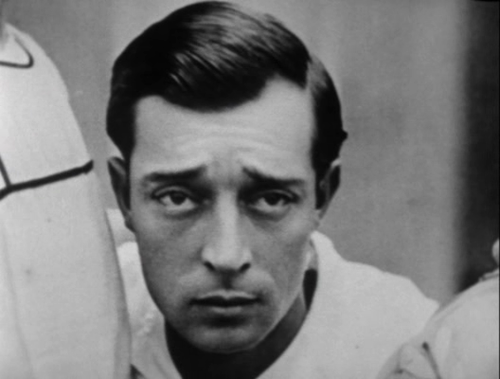 Today I come to the last entry in my series of posts about Buster's start in cinema, with my thoughts on the release of A Country Hero! Here is a film that drops us on the doorstep of a major career and life transition for Keaton. And in true Keaton style, we are treated to a bit of a tease then get the rug pulled out from under us. We know the team had just left New York and headed West. But we don't get to see the first film they shot in California. We don't get to see this, the first film that Keaton's father appeared in (or that Keaton's soon to be wife appeared in). And we don't get to see Keaton's first film to feature a train! Instead what we get is Keaton's only lost film -- one with an intriguing and strange history that includes its denial by his early biographers. In fact, why don't we just start there. One thing that makes A Country Hero odd is how much we seem to "know" about it, given that no one has seen it. Much has actually been written about this film, and much of what's been written has been based on inference and conjecture -- and much of that has been wrong! I want to focus my thoughts on A Country Hero with the study of what we really know and why. Toward that end, I am going to uncharacteristically cite the heck out of things here. My personal Keaton library is unfortunately quite slim, but I've been able to supplement with books from the University Library near me and amazing internet archives that give me access to industry publications and old newspapers that have been invaluable. So let's begin with Rudi Blesh's seminal if flawed 1966 biography of Keaton. 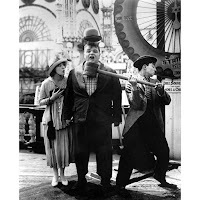 At the time of his writing, many Keaton/Arbuckle films were still considered lost, and it must have been a significant challenge to piece together facts about them while relying on memory and other tidbits available in the early 1960s. The Blesh biography does offer anecdotes on the filming -- including details on Joe Keaton's appearance in it. Blesh gives an involved discussion of how the elder Keaton plied his craft --- the skillful high kick -- which lands the other actors in a water trough and makes Alice Lake cry for real. 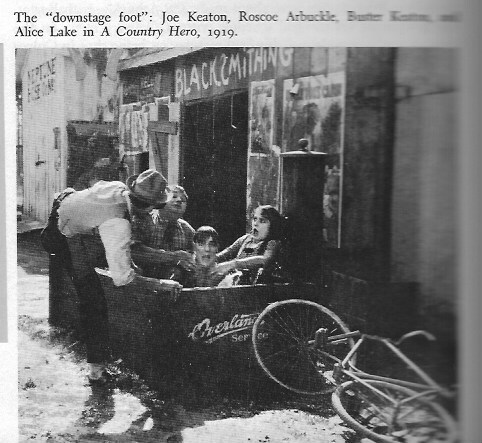 The book includes a still photo from the film, seen below, showing Keaton, Fatty and Lake dunked in the trough. (Though his citation is unfortunately off by about two years). Blesh erroneously classes this film as one of the last, if not the last, film Keaton made with Arbuckle before hanging out his own shingle and making releases for Buster Keaton Studios. Because he was mistaken on the release date of A Country Hero, thinking it came much later, I guess its not surprising that Blesh didn't suspect the large photo adorning pages 106-107 of his book, which is labeled "Arbuckle's Comique company on location," to actually be an assemblage from the film A Country Hero. Some of the early confusion with respect to A Country Hero can be traced to an odd occurrence with the date the film was copyrighted. It appears that that might not have happened until 1920. Blesh probably took the copyright date as some evidence of its release. David Robinson's 1969 biography "Buster Keaton" repeats the error with respect to release date (suggesting 12/13/1920), and ponders whether A Country Hero was being confused and conflated with a different title (The Hayseed). Robinson speculates in this same manner with regard to other pairs of films (Oh Doctor and Goodnight Nurse as well as Out West and A Desert Hero). This is interesting, and not unlike something I might have been inclined to do myself given a diminished film catalog to work with. However, he is wrong on all counts about these films being confused. In particular, A Country Hero is its own film. And it was definitely the first made when the team got to California. And it was definitely released in December of 1917. More about this in a moment. 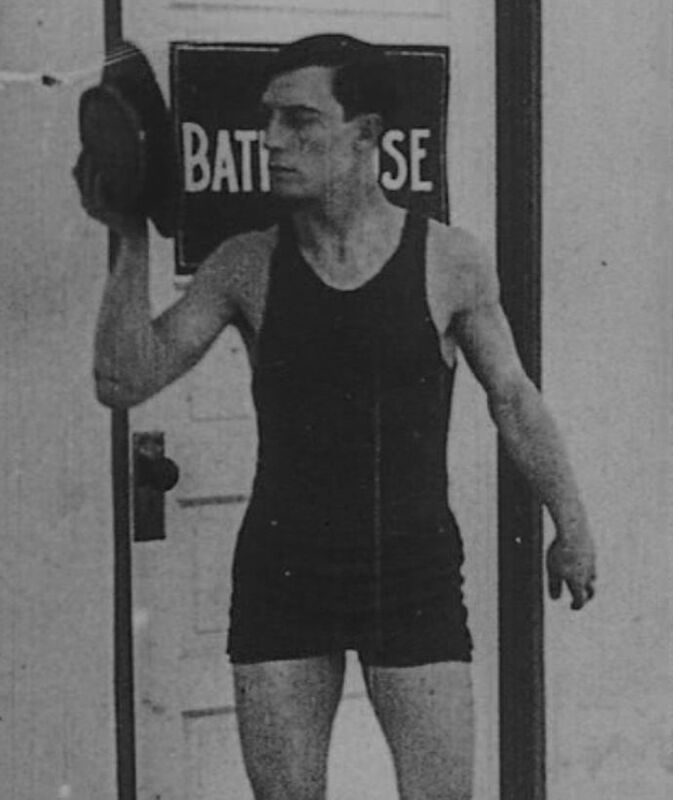 By their 1977 book, "The Film Career of Buster Keaton," George Wead and George Lellis date the film correctly as the first made in California after the troop left New York and correctly state that it was made in Long Beach. The only hint of a reason for the earlier biographers' mistake about release date (of 1920) comes in their filmography where they note that A Country Hero was released on December 10 ['of 1917' is implied by the category heading] and was copyrighted on December 13 [year not given, though 1917 would also be implied by the heading of the entry]. So Wead and Lellis' error is in moving the copyright date forward to 'match' the timing of the release. But at least here we have an idea that the release date and copyright dates may have been different. In fact, the one I really wish I had is by James Neibaur, entitled "Arbuckle and Keaton: Their 14 Film Collaborations." According to the Damnfinos, this book is the definitive guide to these films, and according to my research, it contains a chapter on A Country Hero. Thus, I am dying to know whether there is any more helpful material in the Neibaur volume such as additional interviews or contemporary notices. Until I can get my hands on that volume, I can't help but feel that this post is a work in progress. But, as today is the day, and I need to post something, I will press on with what I (think I) know. I keep asking myself 'why this film?' why is it lost? why did the others get found and not this? It seems that this film has its own special track. It is interesting that it was copyrighted two years after its release, for instance. But I got a hint as to why from an ad that ran in the trade journals in the fall of 1920. Apparently Fatty's films were being collectively re-issued at that time. Maybe the re-release allowed the company to learn that this one had missed being copyrighted. Because this was the first one produced upon getting to California, it would stand to figure that this detail could have fallen through the cracks. Maybe there was someone who handled that for the troupe back in NY but that the move to California shook things up? But, of course, this is all speculation. The film clearly still existed in 1920. When and how its path diverted is a story for the ages that may never be resolved. What we can do is chip away at the details of the plot, characters, and gags the film contained using a variety of sources. Unfortunately, there is not much about the filming found in direct interview accounts. We have, of course, the story about Joe Keaton's high kick that works its way through Buster into the Rudi Blesh biography. We also know that two Ford Automobiles were destroyed by a train while shooting this film and that the stunt cost $20,000. We get this account directly from Fatty through a piece he authored in "Motion Picture Magazine," entitled Cost of a Laugh from March of 1918. This is presumably where David Yallop sourced the account in his 1976 biography of Arbuckle "The Day the Laughter Stopped." Besides these two accounts, I am not aware of other direct descriptions of the filming from those present. Photographs from the film provide an additional valid source of first hand information. These corroborate certain elements (e.g. the train, the trough, the town name) and actors, and can also help us assess which roles the actors played. The richest sources of material probably come from the trade and fan magazines of the day, as well as local reviews. I have used these to flesh out my understanding, as others before me have done. I'd like to acknowledge an excellent blog post by Silentology which goes into great depth imagining the plot of this film! My source for the trade and fan mags was the excellent Media History Digital Library. I scoured any publication with references to "Country Hero". It turned up a number of things in "Motion Picture News" (which I will call MPN), "Variety", "Motography," "Moving Picture Wold" (which I will call MPW). "Four cameramen and two grafted machines were on the scene when a fiver, used by the weighty hero in pursuing the villain and the heroine, blew up unexpectedly in the main street of Jazzville." (The imaginary rural village). The piece states that Jazzville's blacksmith shop is in that main street and seen in the picture as are the Jazz Hotel, post office and other landmarks. The plot is described as telling "of the rivalry between Fatty and Cy Klone, the garage owner, over the affections of a pretty school-teacher." (Alice Lake is named) When a stranger (a city chap) comes to town and tries to "steal" the teacher, the two rivals unite against him. He takes her "to the city", followed by Fatty and Cy who "rescue her from the unscrupulous villain." December 8, 1917 "Roscoe's Breakaway Didn't Break"
While filming a scene for The Country Hero "at the Balboa Studio in Long Beach," Fatty had two chairs and an upright piano broken over him during a stage fight with 5 men. 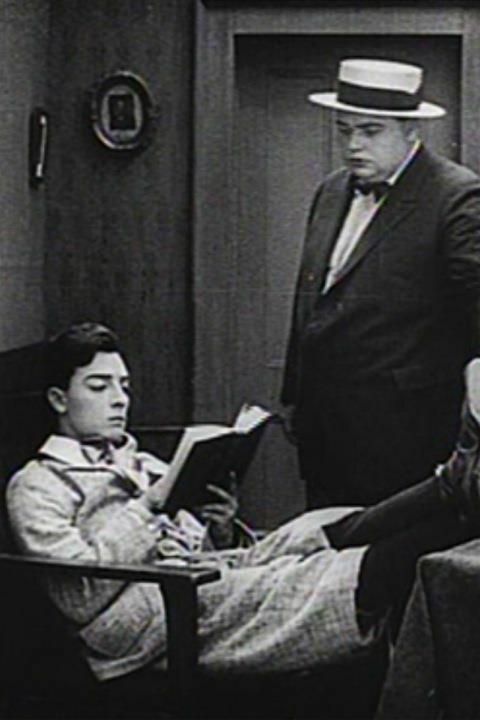 The "breakaway" furniture "failed to break properly and Arbuckle was nearly knocked out." 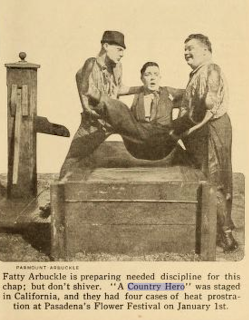 This piece describes Arbuckle as the director (and "instigator") of the film and its gags, and since no one suspected any harm, the camera kept grinding. Later, he went to the studio's hospital with a hens-egg sized contusion on his head. This is a lot to process, but from these, and other accounts, we can glean or confirm. • A Country Hero is Arbuckle's first film in California. MPN v 16, no 22 Dec 1, 1917. 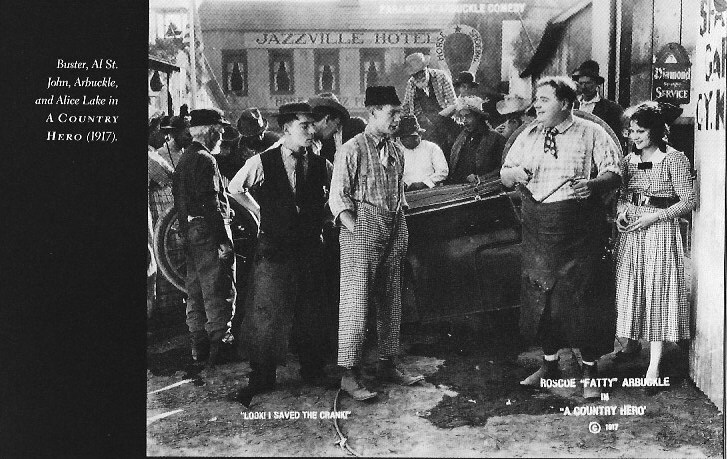 • Arbuckle scouted for a great location to create the fictional town of "Jazzville", by driving around, but had no luck, so instead constructed the set at his Long Beach studio. MPN v 16, no 20 Nov 17, 1917, also MPW Nov 24, 1917. • There are some gags where people end up in a water trough that is in front of the blacksmith shop. MPW Dec 8. Probably via Joe Keaton's foot. Blesh book. • there is a scene with "a cafe raid, in which Fatty hurls a player piano at a guest" MPN v 16, no 24 Dec 15, 1917 - &/OR - in which Fatty has a player piano broken over him. MPW Dec 1 - &/OR - in which Fatty uses the piano as a club to bash things. MPW Dec 8. • a character named Fatima does a snake charmer bit. MPW 12/8/17. 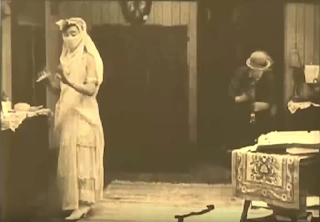 The character is played by Keaton. (Various sources and general Keaton knowledge :) as well as photos that this was his bit. With all this information, I was hoping to glean a definitive sense of who played Cy Klone the local rival and who played the city dude (true bad guy). But it really isn't clear. I turned to the Library of Congress' Chronicling America newspaper database to see what kinds of local film reviews this might turn up. I actually found several hundred results that mentioned the film and did not wade through them all, but skimmed for occurrences that appeared to be inside the margins of regular newspaper print and not part of an ad for the film. Most of these blurbs were very brief (and tended to suggest that the film was excellent, or his best ever). I found just two that gave additional details or plot summaries and were more than a line or two that appeared to be written by a local person. The "Bemidji Daily Pioneer," Saturday Dec 15, 1917 has a piece entitled "Elko Tonight" with the following: "Fatty Arbuckle in 'A Country Hero'. In the first place there is Fatty's encounter with a refractory automobile which exhibits all the obstinate tendencies of a balky mule as specified by the scenario. It runs up to 'Fatty's Garage", known as "The Spark Plug Garage." Finally, for some unexplained reason of its own, the machine starts with an explosion that could be heard from Long Beach to Los Angeles." This piece confounds things in a few ways, suggesting that Fatty is the garage owner and tentatively calling the garage "Fatty's Garage" before allowing it to be "The Spark Plug". 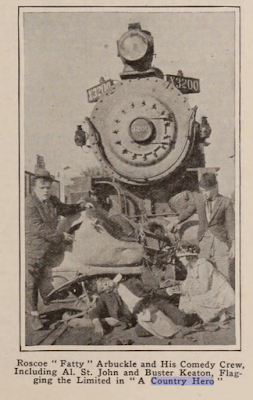 Though it confirms the explosion that is described in Moving Picture World, Dec 1. The "Rock Island Argus" (Rock Island, IL), dated Dec 21, 1917, from a piece entitled "At Spencer Square" provided probably the best summary I have seen of the film anywhere. It states: "they are in a village of about five hundred inhabitants. There is the Jazzville hotel, the Jazzville dancing club and the Jazzville jazz band. There is the town pest, taken by Buster Keeton, he of the limber frame, while Fatty is the village blacksmith and Al St John is the town garage owner and dude all rolled in one. Miss Lake is the village belle and there is a fierce competition for her hand which is nearly broken up when the handsome city stranger puts in an appearance with his polished manners. He gets the girl away from the dance, throws her into an automobile and they race to the city, where chase is given by Fatty and Al. How the two clean out the guilded cafe and rescue the girl all forms part of one of the funniest films ever made." This review is quite clear in naming Al St John as the garage owner. Of course it is possible to have mixed him up with Joe Keaton, though that doesn't seem very likely. It is not clear who plays the romantic rival (Cy Klone). The conventional wisdom seems to be that Joe Keaton plays the local rival (see IMDB, Wikipedia). However, the movie review from Rock Island Illinois states that Al St John played Cy Klone. Further, Joe Keaton's own account -- as filtered through his son and then Rudi Blesh -- is that Joe played the school teacher's father, not a would be suitor. (This later take would seem more believable given the elder Keaton's other turns as a dad to either Buster or a love interest in later films. I am personally inclined to believe Joe Keaton would have played a small and random part in this, his first film. As a minor storekeeper, who could easily also be Alice Lake's father, he would have incentive to kick the others all into the trough. And St John as the romantic local rival does make sense, given that this would be a typical role for him. So who played the city dude?? Maybe St John doubled in that role? (There are photos from the film that have Al looking fairly dapper). Maybe Keaton doubled in that role? (Some of the film stills also have Keaton looking rather dapper). One final little mystery I will leave you with involves the title of the flick. Modern sources are pretty consistent in calling this film A Country Hero. However, I turned up many many ads as well as industry material from the time referring to the film as The Country Hero. I'd like to believe that someone has checked the copyright and maybe that that would govern? But honestly, I don't know. One thing does seem certain: this film sounds fantastic! It got strong reviews. While I was perusing all the hundreds of local paper ads and notices, they were almost all very positive. Of course it was their job to drum up business, but there were strikingly good things that kept coming out. Keaton's snake charmer bit seems to have been very well regarded and the other effects (the train crash, the explosion, the big fight) all seemed powerful and interesting. It seems clear that the California big sky was working its magic and Comique was now doing BIG things. They have come along way since March. I'm optimistic enough to believe that someday this film might turn up. Maybe someone will find a cache of film in an attic and return this work to the adoring masses, while completing the Keaton collection! Until then, I will chip away at these mysteries any chance I get and share with the blog whatever I learn. It has been a fun -- if crazy -- year for me to have this self-imposed urgency to research, write, watch and think about Keaton. If nothing else, I've exposed big gaps in my understanding and blocked out research projects to keep me busy for years to come! Although, I won't continue to celebrate each release on its centenial, I will continue to update the blog with other material. So for now, I wish Keaton followers a Happy Centennial Year! and Happy Viewing! Taking a break from the soothing world of silent comedy and the simpler and infinitely more desirable life principles it supports, I'll write about the crazy world of social media circa 2017. I don't know if this post is really about what Buster would do... but I know its about what I would (or wouldn't). I learned this week why I am definitively a consumer of great content (books, podcasts, dvd commentary, other blogs, etc) and a sometime purveyor of mediocre content (blushes). . . but almost never a networker in the world of The Fandom. 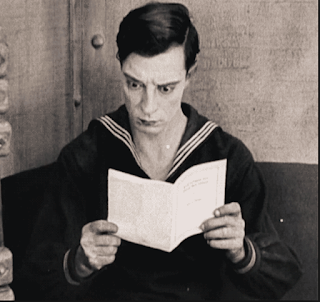 I discovered Buster Keaton in the summer of 2012. It didn't take long for him to take over my brain. An almost immediate byproduct of that takeover was this blog. I found it easy and fun to slip into this forum for publishing my own musings on this great man. Though with a healthy enough ego to believe that others might be interested, I admit I wrote with the main intent of pleasing myself. Lurking somewhere in the back of my thoughts might be a shadowy pipe dream of someday becoming a "real" Keaton scholar ... maybe even writing a book...with a larger purpose of promoting Keaton's legacy. That said, basically just know that you've stumbled upon the blog of a dilettante, content to live in her own little world but offer a gracious welcome to anyone who shows up here. By that I mean you. If you are reading this you're welcome, because, really, isn't that just how it should work? And if you do cool things related to Buster, you are also very welcome to chat about them to me. Because... really, isn't that how it should work? And ... by the way... if I fail to respond in a timely way, I hope you'll forgive that as I'm often pulled in other directions by day jobs that force Buster-love to the back burner. And, honestly. Isn't that how all of this should work too? And if all this sounds like its leading to something, it is. The other day, while waiting to head out to dinner, I relaxed by paging through my facebook feed, then stopped with a jolt when I saw my own blog post staring back at me from the pages of a Buster Keaton fan site that I followed! I was flattered and pleased. This doesn't happen to me every day. The post was asking "does anyone know whose blog this is?" It was all very nice, warmed my heart and made me feel connected and special. When I logged back into facebook the next day, I discovered with confusion that the post had been removed. I can't imagine why. I know I've seen countless links on that public group to other people's websites, films, and projects. And I don't think there was anything objectionable in the friendly comments that were exchanged about my blog. I also have a hard time believing that my blog itself -- which consists in gushing about the same person the facebook fan group gushes about -- could possibly offend. So I'm left startled in wonderment, feeling like a new kid at school who was tentatively approached by a friendly soul only to have the class bully lumber up and say: "we don't play with her." When I think about Keaton, I can't fathom his being able to put up with such silly stuff either. I mean... he made movies. He was glad when they played them. If a group of colleagues displayed his posters one day only to have the group leader remove them the next without explanation, I bet he'd have found that strange. I bet his attitude would have been: "Love me, hate me, or leave me alone. Just don't be petty and weird around me." I know I can't speak for Keaton, but I'll speak for myself. I love blogging about Keaton. But I don't like the playground territoriality and social machinery that seem to come with organized fandom. It's what holds me back from joining groups like the Damnfinos. Its what keeps me from commenting on other people's blogs. I find the rules of social media to be strange and unfriendly and I often have no idea when they have been crossed. If you read my blog (thank you), find it enjoyable (thank you still more! ), and wonder why I don't get out more... its because of things like this recent facebook interaction. I don't know who got offended with that exchange nor why it was removed and I really don't want to have to care. It will take a LOT more readers before I can quit the day jobs and spend my time making social media my concern. In the meantime, I will be over here writing about Buster every chance I get. Please know, gracious reader, know that if anyone wants to share what I'm doing -- the old-fashioned way through word of actual mouth, or in any new-fangled way, through word of pixel, digit or electron -- they are both welcomed and encouraged to do so. Also, I promise that as long as your comments are civil and relevant, I am THRILLED to have them and publish them. 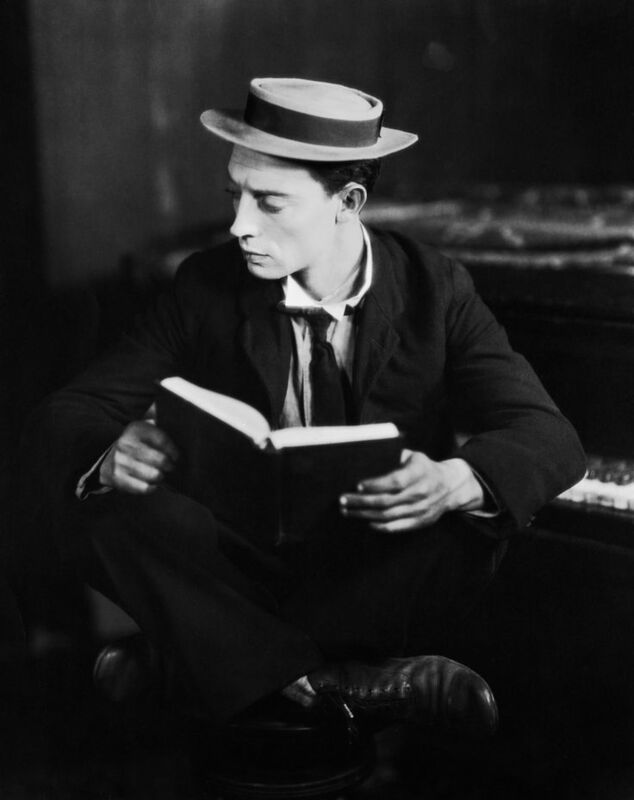 I wish you well and think that anything that leads to more public knowledge of Buster Keaton can only be a good thing for his legacy. Oh Doctor! is the next entry in the Keaton Centennial Blog Extravaganza. Ha, I just made that up now. I probably should have come up with a catchy title for what I'm doing a while ago. I guess I didn't properly plan it out. ... But unlike me, Oh Doctor! does have the feel of something that has been planned out. I mean, shockingly well-planned ... for a Fatty Arbuckle film that is. This film is remarkable in that . . . wait for it: it has an actual plot. A pretty decent one too. Another thing it has is intrigue and even a bit of complexity. Unfortunately what it lacks is a good role for Buster Keaton. Though in many ways it is clear that Keaton's influence has continued to grow at Comique and he is now a fully-integrated player taking on more and more. For instance, Keaton receives first billing after Arbuckle, and, for the first time ever, even enters the film in its first scene. Keaton's influence can be felt in a couple other ways that I'll get to. I have no way of knowing whether we have Keaton or someone else to thank for the more developed story here, but there is no doubt that this film feels different from Comique films that have preceded it. Maybe a change in location got the creative juices flowing in a different direction. After all, this was the first film the team made after departing the Colony Studio building on 48th Street in Manhattan, for new digs out in the Bronx. 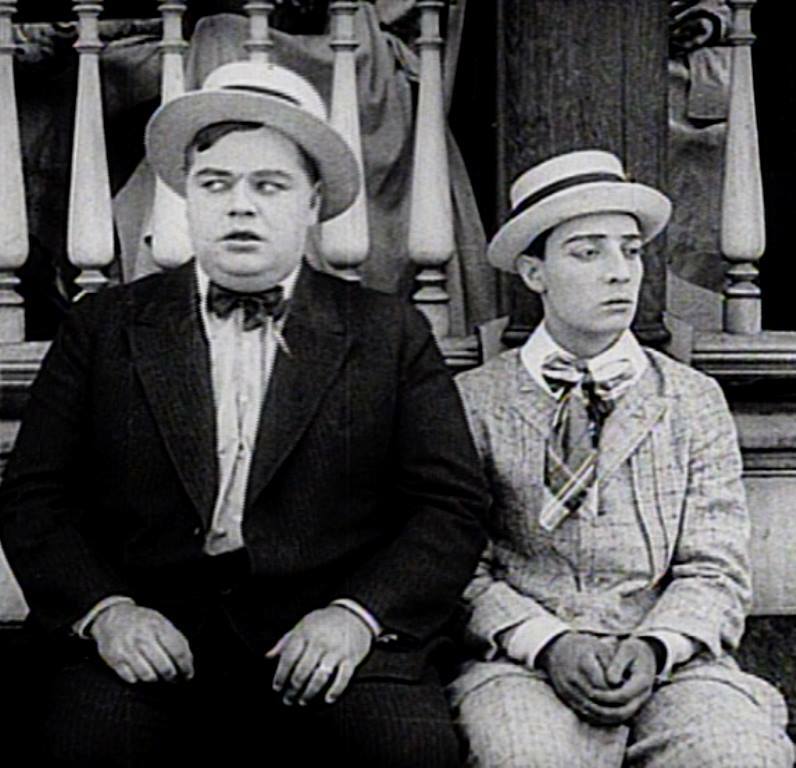 The three prior films, which were made in Manhattan, followed a formula that went pretty much like this: Fatty is introduced as a proprietor of some type of business and given an opportunity to showcase some dexterous comedy skills; Fatty's love interest is then spotlighted; a love triangle is set up - with Al St John in the role as rival; a character played by Buster Keaton and ancillary to the action is given an opportunity to be a breath of fresh air; then chaos ensues, and finally Fatty ends up with the girl. It was a good enough formula and seemed to be working for the team. But this movie doesn't follow it. In Oh Doctor! Arbuckle is introduced to the viewer as both a family man and a doctor. He seems to be reasonably wealthy and lives in a well-appointed house. The action begins as he and his family go to the races, where a world of intrigue and ensnarement await them. As if that weren't different enough, the regular roles of the supporting players have morphed too. Instead of a rival in love, Al St John plays more of a rival in economics and the big kicker is that Buster plays Fatty Arbuckle's son. I have to admit that this relationship did not work for me. It took quite a while for me to realize that Keaton was playing a young child (how young he's supposed to be I have no idea). Truth is, I found this role a bit irritating and it wasn't until I watched a second time -- and just kind of relaxed and went with it -- that I was able to get a bit more joy out of the performance. The first time around I found the broad gesticulation, the mouth open crying and other highly expressive actions distracting. Once I understood that Keaton was meant to be a CHILD, these choices were not only easier to forgive, but actually to find impressive. (Like his performance as a monkey in a film many years hence, we do get a feel for Keaton's great skills in mimicry). So, as I say, Fatty is a reasonably rich doctor in town. He, his wife and son go to the horse races one day. Fatty sees a very attractive vamp-type woman (Alice Mann) and intentionally makes his child cry so that his wife will attend to the boy and Fatty can sit near the vamp. The femme fatale and her boyfriend-gambler (Al St John), are in cahoots -- with Fatty as their mark. A bookie friend gives Al a tip on a horse called Lightening. Fatty listens in, thinks he can't lose, and bets all his money -- $1,000 -- on this horse. The horse, of course, not only loses, but is so very inept he runs the wrong way -- a source of great joy for child-Keaton. The family goes home, completely broke, and the scene cuts to St John and the vamp back at their apartment. Actually I'm not sure whether they were playing Fatty before, as they may have lost money on the horse too... I can't quite tell, but in any case, they're going to play him now. She calls him up with a fake ailment. En route to see her, Fatty tries to drum up some business for himself, as he is now desperate, by allowing his car to roll into a crowd gathered to hear a health-tonic huckster. I guess that's one way to do it! He continues on to the home of the vamp and knocks -- on the door, then, when it opens, on the chest of the maid (played by Alice Lake). So no one can be surprised that at the apartment, Fatty makes the moves on the vamp - including entertainingly mixing drinks out of his medical bag - while St John steals away over to the Doctor's home... to steal the fancy necklace Fatty's wife was wearing. As Al flees with the necklace, Boy-Buster comes in, becomes suspicious and follows him. Back at the Vamp's, she gets a call to have Fatty? put money down on a horse with 500 to 1 odds, because they've made a deal with the jockey. (I'm still a little confused on this.) But it's clear that there is now a team of con artists in on the sting and the team actually stages, for Fatty's benefit, a fake book-making operation. In fact, I exclaimed in delight when I realized that the scene here is just like one in the great film from the 1970s The Sting! If I remember to do it, it would be fun to look into any influence early films like this may have had on that period masterpiece. But again, I digress. The point is that the fake bookmakers take Fatty's money, when this horse is bound to lose. Cutting back to Buster, everything now comes to a head. The boy has tracked Al back home where his mother's stolen necklace is being presented to the vamp. Buster calls his mom and all hell breaks loose. (So.. I guess it's a bit like the old formula after all). Everyone is at cross purposes - the wife to get her necklace back, Al to hide from Fatty, Fatty to hide from his wife (since he's romancing the vamp). The women tussle, knocking out Al in the process; Fatty, while hiding in the kitchen, grabs the police jacket of the maid's rotund boyfriend, and chases after Al (not quite sure why), wife makes a grab for her necklace but ends up locked in a closet! Then everything resolves. (I said it had a plot. Not that it had a perfectly coherent plot!) For some reason, "Romeo," the 500 to 1 odds horse, wins! Fatty's rich. Except, the whole thing was faked. But Fatty doesn't know this, so he shows up to get his winnings (still in the cop suit) and the guys, thinking its a bust, all scram. Fatty enters, sees no one to pay him out but tons of money lying everywhere, and helps himself. Even with so much money -- enough to toss some on the ground because it smells bad -- he still has a mixed bag of an ending, walking off and getting kicked by his still-angry wife. Unquestionably the horse is superior to man. One hundred thousand men will go see a horse race but I bet not a single horse would go see one hundred thousand men run. Whoever selected or wrote that one is a genius. The typical, would be the confusing chaos that we come to expect somewhere in an Arbuckle endeavor. It had to have suited audiences at the time and no doubt Fatty knew his market! I mentioned early on that other parts of this film seem to show Keaton's influence. I'm always ready to attribute good ideas to my man, but I think it's only fair to attribute bad as well. Here, the choice to have Keaton play a child strikes me as probably Keaton's. It seems like his brainchild in that it bears such similarity to the type of knockabout act the Three Keatons were known to have done on Vaudeville. Here Buster calls Fatty "Pop" and Fatty manhandles the boy just like Joe Keaton must have done on stage. The thing is... the style of acting that probably worked great on stage doesn't work here. Its overdone. There I said it. Further, while Keaton does evince great talent in terms of mimicking the spirit of a child, I have to say that his role is uneven and confusing. It's hard to know how old he's supposed to be 7? 10? 14? -- there is so much variability, from the crying jags, to the fairly grown up tracking of a bad guy and composed phone call. I expect Keaton to be attentive to details, precisely because he is always so attentive to details, that his performance in this film strikes me as really 'off' and is not going to go down as a favored Keaton performance for me. 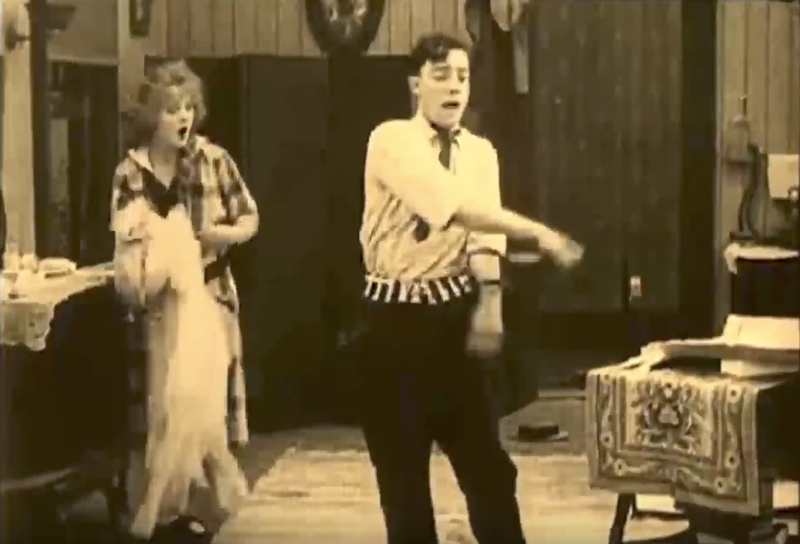 Although Buster, as child, plays a role that is mercifully fairly limited, I do think I see his presence in a number of falls and stunts for other players in the film. Particularly, is that him in the background taking a fall underneath the runaway car? and I wonder if a moment later, in the scene where Fatty hops into said car, this is actually Keaton in a fat suit. Not that Arbuckle isn't physically talented and capable of the jump, but the camera is avoiding his face and the jump looks like Keaton. Also.. there's a bit near the end where the mom takes a fall that I am sure looks like Buster doing the stunt. My hunch is Keaton is taking a bigger and bigger role in planning the stunts, offering direction for the action and maybe even helping with story direction and plot?? I know what's coming next... and I know it a film that seems to build on some of these same elements, and one that bears even more of the distinctive Keaton stamp. In fact, it's my favorite of the Arbuckle collaborations. It's Coney Island. Can't wait to re-view it at the century mark and see how it feels in progression. Coney Island is the last of the New York productions for these guys. The troupe is about to move to California. In fact, I came across a number of notices in the trade journals from this time that suggest the team was leaving for California right now. I mean, right as this film (Oh Doctor!) was released. Obviously they must be in post-production for Coney Island already. One last thing to note, from having perused the magazines, is that contemporary reviews did not seem too stellar for Oh Doctor! Oddly, it is the departure from formula that got cited as not feeling like an Arbuckle comedy. 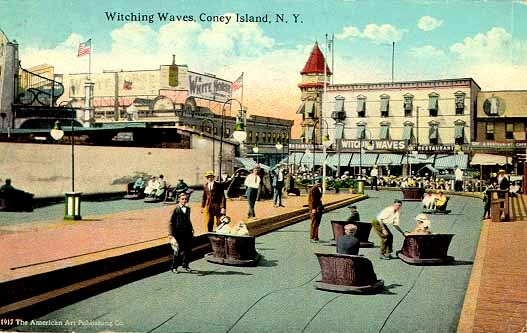 We'll see how, and to what extent, Coney Island keeps some of these newer elements and perhaps returns in other ways to the old Arbuckle style. Looking forward to it already! The Centennial Trip down memory lane continues with our next installment from the gang! 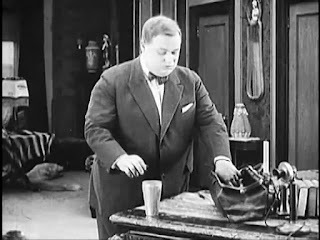 It was 100 years ago TODAY (please appreciate the heroic efforts I'm going through to actually stay on the schedule I set for myself, lol) that the film was released in theaters, treating the world to the antics of a great team of silent comics including Al St John, Buster Keaton and Fatty Arbuckle. The "his" in the title of the film is of course Fatty, a clerk at a drugstore. The lucky lady who will soon be his bride is Alice Mann. The misnomer is that any part of the film involves a wedding night! It, does at the very end, get to the wedding. And that's where much of the fun is. I was going to say that overall the film feels a bit weak or uneven, but the truth is it feels pretty par for the course for the Keaton Arbuckle collaborations. There are some truly glorious moments that feature Buster as well as some embarrassing moments that are harder to watch; there is the chaos and rough and tumble slapstick that we expect and deserve in a film like this and all in all I'd call it very watchable and fun. That said . . . enjoying a film (almost any film) from 100 years ago requires a healthy dose of indulgence. We have to allow for the time period and try not to judge too harshly relative to our own lens some more troublesome things we see. 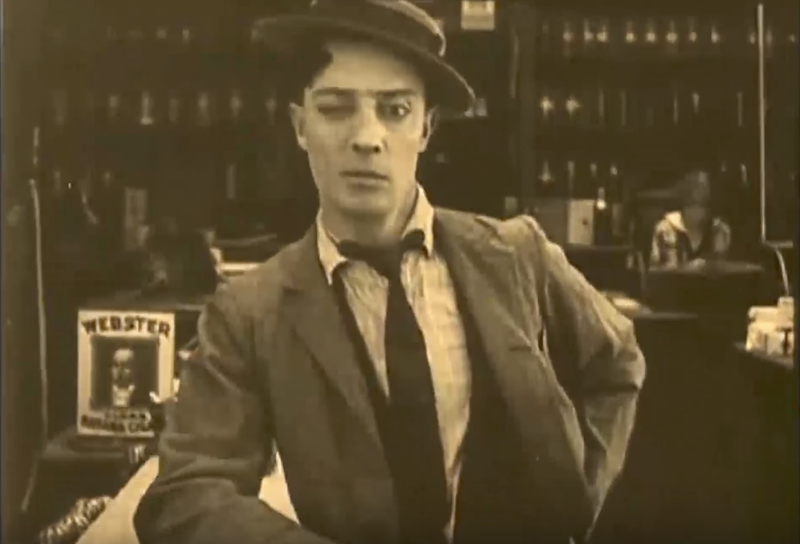 For me in fact, the whole point of watching and reviewing these now, this year, is to look back and learn, to experience that bit of the past -- learn more about Keaton and his beginnings, note the working relationship with Arbuckle and other players and see the evolution unfold. We're here for Buster . . . and he once again proves that he can deliver the goods. I mean that literally too, as he enters the film as a delivery boy bringing Alice's wedding dress (at around the 8 minute mark). The production team has clearly found a formula that works and they are sticking with it. 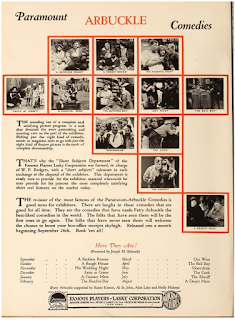 All three Comique films have unfolded in much the same way: with Fatty -- as some sort of proprietor of a business -- being introduced first, then some plot-less opportunities to showcase his great deftness and skill as a physical comedian, then the introduction of a love interest/love triangle with Al St John in a romantic rival position. And then, about a third of the way through, we get Buster blazing in as a breath of fresh air to do something really clever or introduce a new element or twist. In this case, Buster on a bicycle crashes into the entrance of the store and gets something in his eye which he tries to get out by blinking. This is interpreted as a sign - a symbolic wink - by Fatty who compliantly serves him up a bottle of beer (and of course helps himself to some). By the way, this is pre-prohbition, so the secrecy Fatty portrays must be related to the fact that this is a drugstore not a bar. -though Fatty makes some attempts to tavern-ify the place for Buster. What happens next is something we see still images from all the time because of how visually delightful it is. When Alice sees Buster with the dress box she whisks him away upstairs to see "what the dress looks like" and then, crazily, has Buster model it for her! This is hilarious for (1) how willingly the delivery boy starts to disrobe and put on a dress, (maybe that's the point of the beer scene! ), (2) for the display of some fierce striped boxer shorts, (3) for how charming Alice Mann is as the excited bride to be having this boy put on her dress, (4) for how similar they are in size to each other, making this an actually sensible scheme, and (5) for how fantastic Buster looks in this lovely stylish, lacy, tiered wedding dress! While Alice and Buster are cavorting upstairs (shouldn't Fatty see him as a more significant rival here!? ), Fatty is getting frustrated downstairs by how many people are availing themselves of the free perfume samples. He takes action, replacing it with chloroform. Next comes the bit I mentioned above where a young woman who is shopping is led over to the chloroform, sprays it on herself, passes out in a chair where Fatty eyes her up and then goes in for some kisses. I have to say, it doesn't work well for me, even beyond the issue of the personal violation. The logic isn't clear. Fatty seems surprised that the woman has keeled over, though he's the one who swapped out the perfume; its hard to know whether to view this as planned or opportunistic. In any case, the chemical serves its higher narrative purpose by knocking out everyone in the store so that Al St John and his thugs can rush upstairs and capture Buster -- who is now wearing a veil and doing his nails -- believing him to be Alice. "She" is sped off in a stolen car to the justice of the peace who is forced at gunpoint to perform a wedding between Buster and Al. 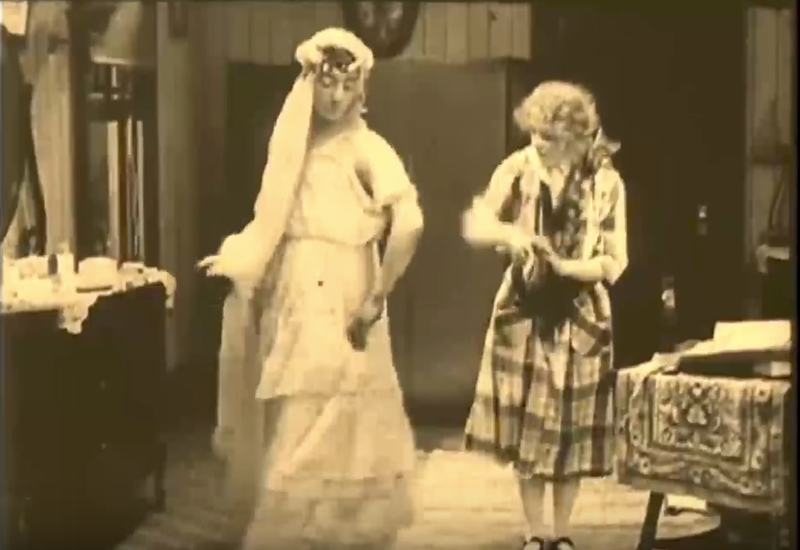 Just in the knick of time, our gang back at the drugstore works out what's happened and puts a stop to the wedding, only to reveal that the almost-bride was Buster (still winking) and not Alice. But no worries, she works it all out and shows up too. Fatty and Alice get married instead, and the chloroform serves one last function -- to incapacitate the preacher who is charging too much for his services! The best parts of the film are the seamless flips and falls on display from Keaton and St John, the fluid sweetness and dexterity from Arbuckle, the charm of Mann and of course the wonderful images of Keaton winking and modeling in a wedding gown. But what I find important about the film is not its great value as great cinema (which is isn't), but rather how it shows the firming up of this team into a well-oiled machine with clear parts. Its the last of the first phase of Keaton's film career in another way. 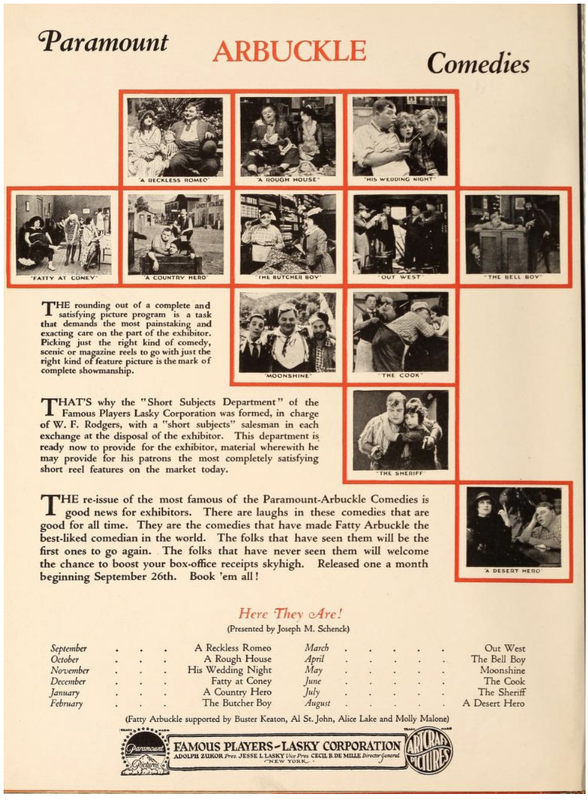 According to Rudi Blesh, in the biography "Keaton", the team that worked on the film in July of 1917 was a "compact, congenial crew," but they must have been irritating to neighboring tenants! At this point, complaints about their noise forced them to leave the studio on 42nd Street and relocate uptown to the Bronx. This is one of the early films that set us up for Keaton's growth as a filmmaker. And, as before, we can already see his influence in some of the more clever visual elements - like the way the dressing screen drops away to frame Keaton as if a model on a stage. There is another shot right before St. John's kidnapping of Keaton, where we see the thugs outside and can view Keaton in the wedding gown upstairs through a window. Its a lovely composition! It strikes me as Keatonesque, and maybe was a composition suggested by him? 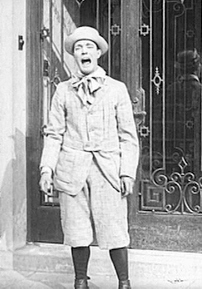 Or, it could also be an example of Arbuckle's style that influenced Keaton later. We'll never know. Unless, continual reading of biographies turns up a detail on this production. As of now, I haven't seen much written about the making of this film.